Well today is the last day of another successful Stampin Up Sale-a-bration. You have until midnight Mountain Time to place an order to receive the free SAB items. I thought I would say goodbye to SAB with today’s card featuring mostly SAB items. 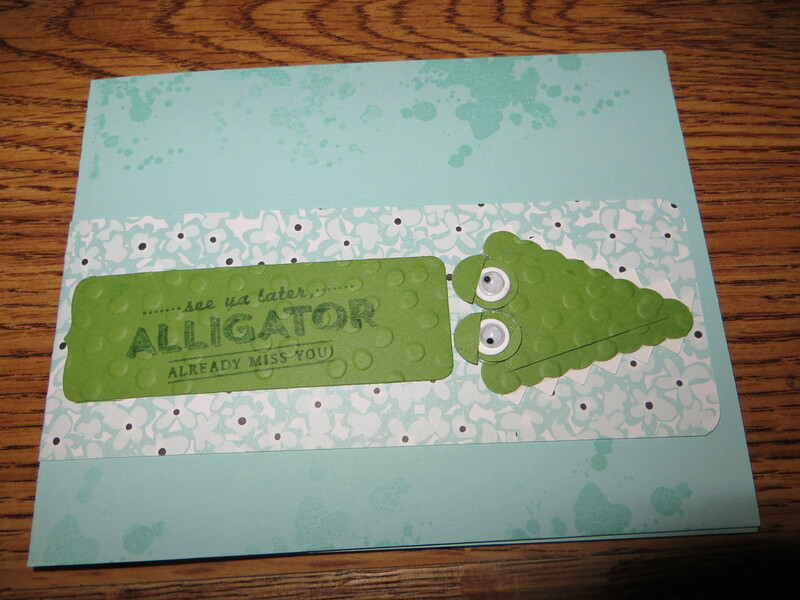 For the swampy effect, I used the Gorgeous Grunge #130517 to stamp the background of this card using monochromatic color-pool party ink on pool party cardstock. 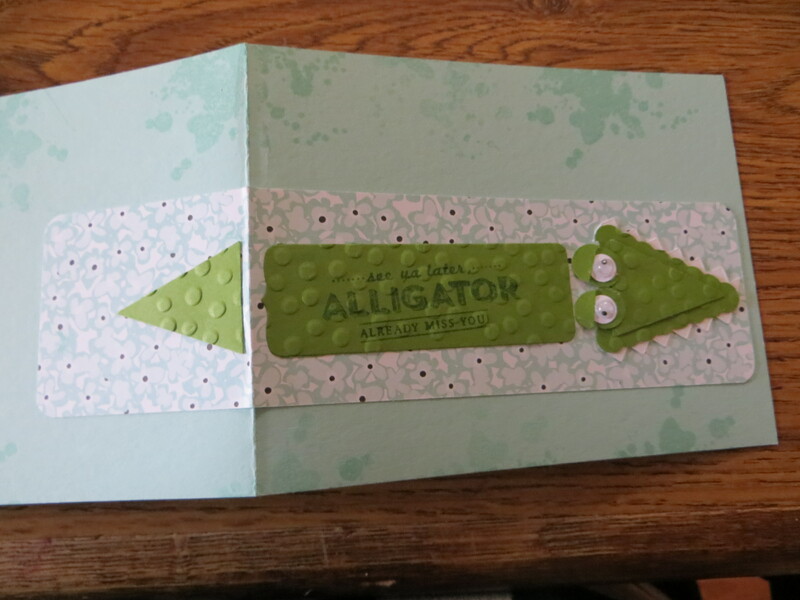 I added a strip of sweet sorbet DSP #133521 (free SAB item) to create a “lily pad” I then created the alligator using the Petite Pennants Builder #122362 punch for the head, the teeth were cut using the Tasteful Trim Bigz XL die #120893 and the eyelids were punched using the Owl Builder #118074 punch. For the body I used the Chalk Talk #129983 and stamped the See Ya Later #133533 (Free SAB Item) and then textured the head and body with the Decorative Dots #133520 (Free SAB item) to give it the alligator feel. I got really creative by wrapping the DSP around the back of the card and added his tail punched from Petite Pennants Builder punch. 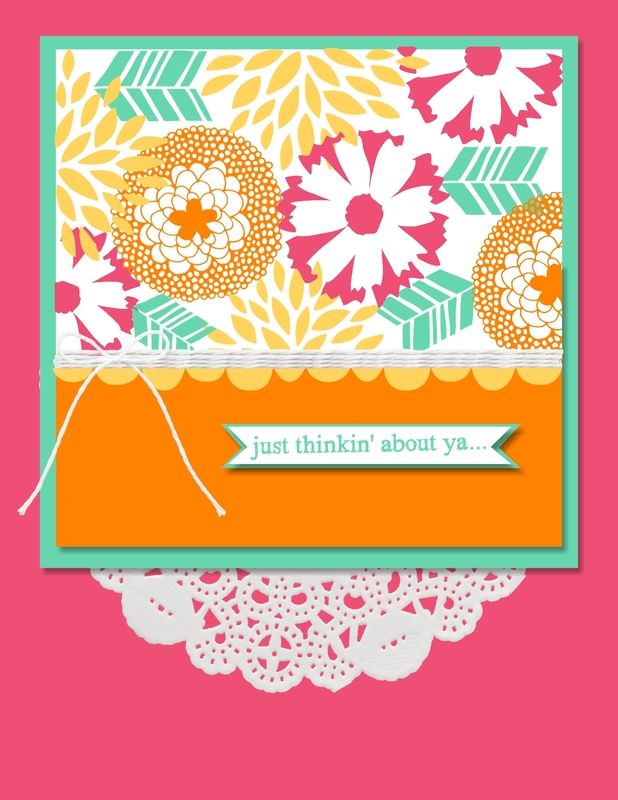 I think this made for a cute surprise and a fond farewell for the Stampin Up Sale-a-Bration. See ya later! I was inspired by yesterday’s card that Cammie made and today’s post is the version I came up with. I used a piece of strip of Kaleidoscope DSP #132995. The card features the Peachy Keen #133113 stampset and the On Film Framelits #132969 from the Stampin Up occasions catalog. The Peachy Keen stampset and the Framelits are a bundled item (wood #135224 and clear #135225) when purchasing together. I completed the card by adding random rhinestone bling. Today’s card is the card Cammie made me for my birthday. 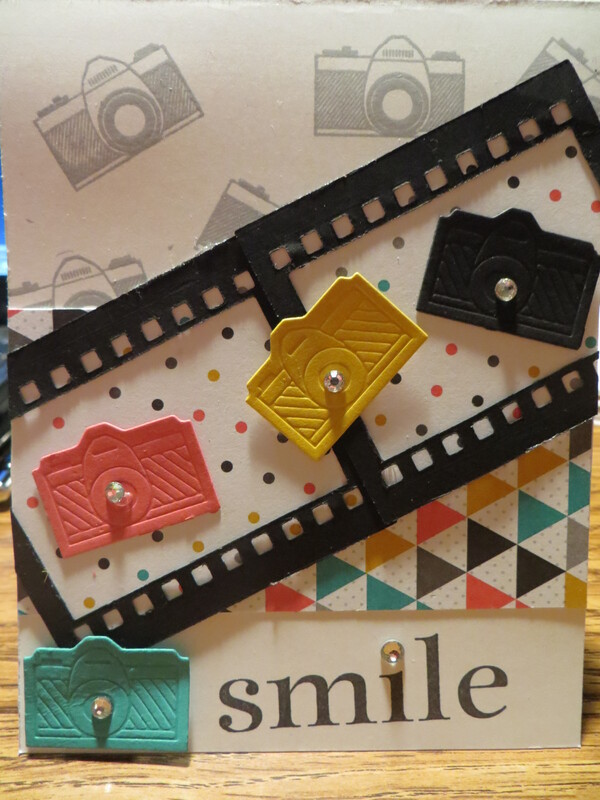 The card features the Peachy Keen #133113 stampset and the On Film Framelits #132969 from the Stampin Up occasions catalog. The Peachy Keen stampset and the Framelits are a bundled item (wood #135224 and clear #135225) when purchasing together. 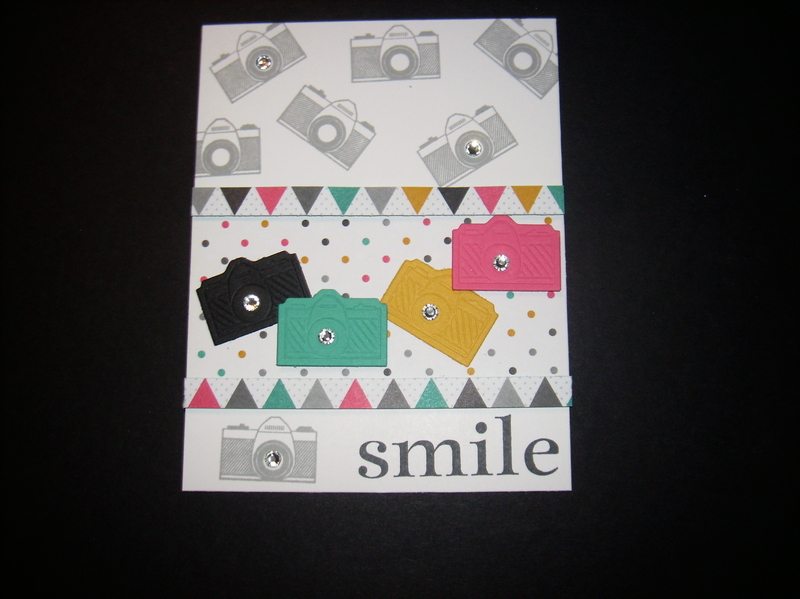 She paired the Peachy Keen stampset with the Kaleidoscope DSP #132995 and she added rhinestone bling to the camera centers. Today’s post is an out of the ordinary for me. 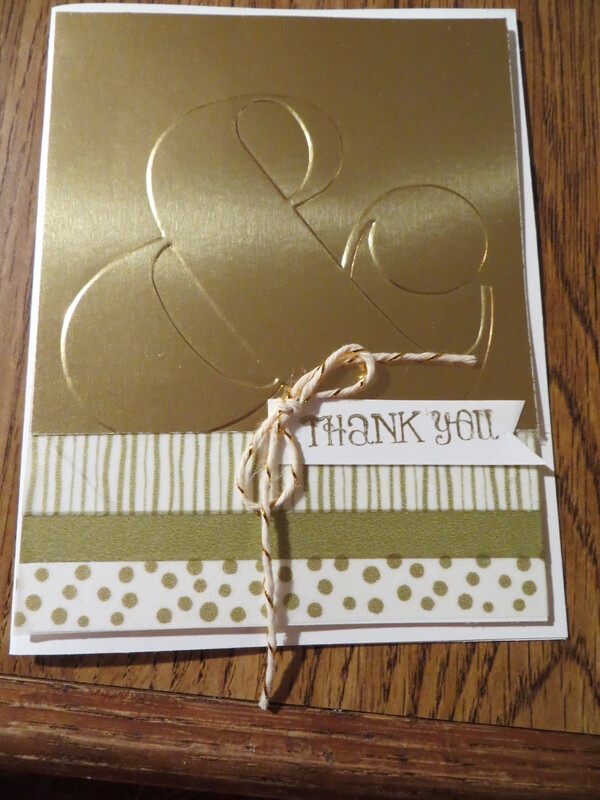 I am really not a gold fan but this card came out great and is all product from the Stampin Up occasions catalog. The card base is the gold foil sheets #132622 embossed with the Ampersand #132970 and then the Watercolor Wonder Designer Washi Tape #133000. I added a hand cut a banner and added the sentiment from the Happy Watercolor #133191 stampset and a gold bakers twine #132975 bow. This card turned out great and would be great for golden anniversary. For today’s card, I wanted to showcase the wonderful Fresh Prints Designer Series Paper Pack #132996 from the Stampin Up occasions catalog. The Fresh Prints DSP is a pack of 48 (4 each of 12 designs) of 4 1/2″ X 6 ” sheets of paper. 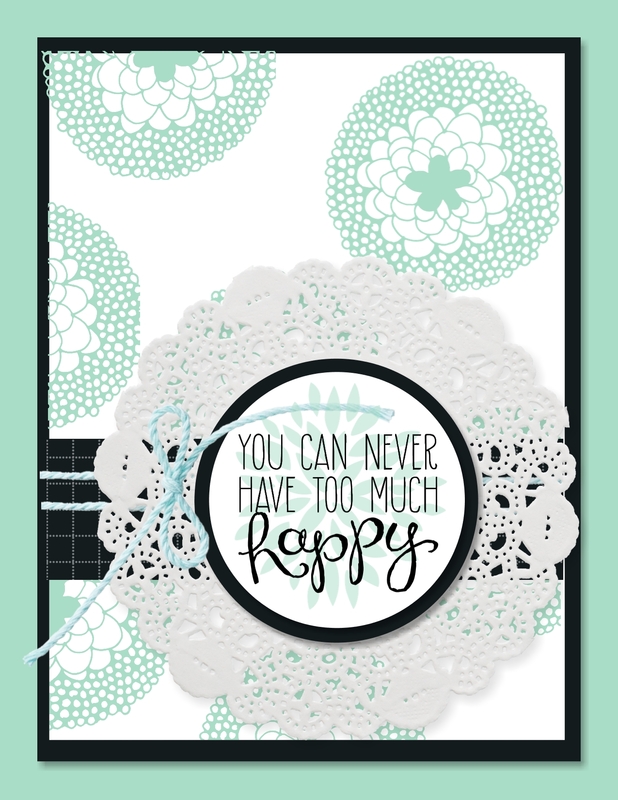 The designs are all Fresh and Fun and makes for a perfect card. 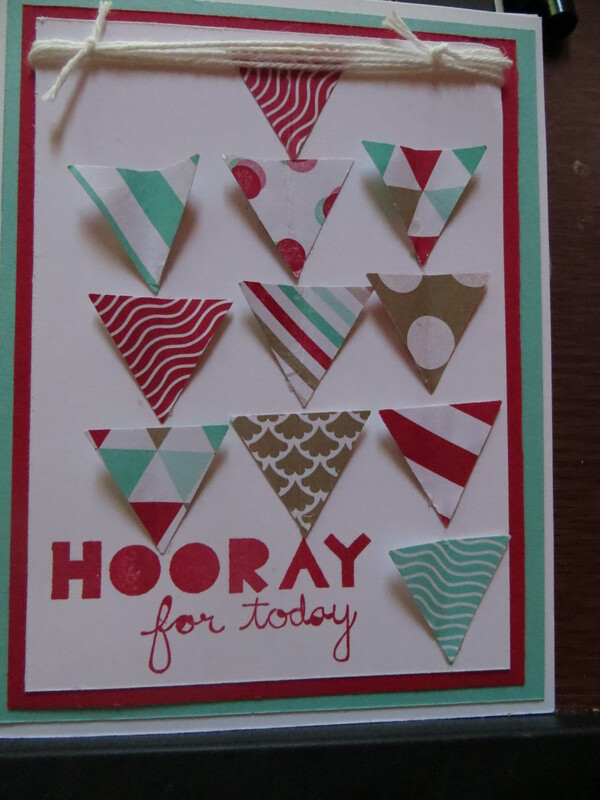 I used the triangle punch #133375 and the Geometrical stamp set #133161 and I finished the card with bakers twine. The Geometrical stamp and triangle punch are available as a bundle (wood #134941 and clear #134942) and save 15% when purchased together.